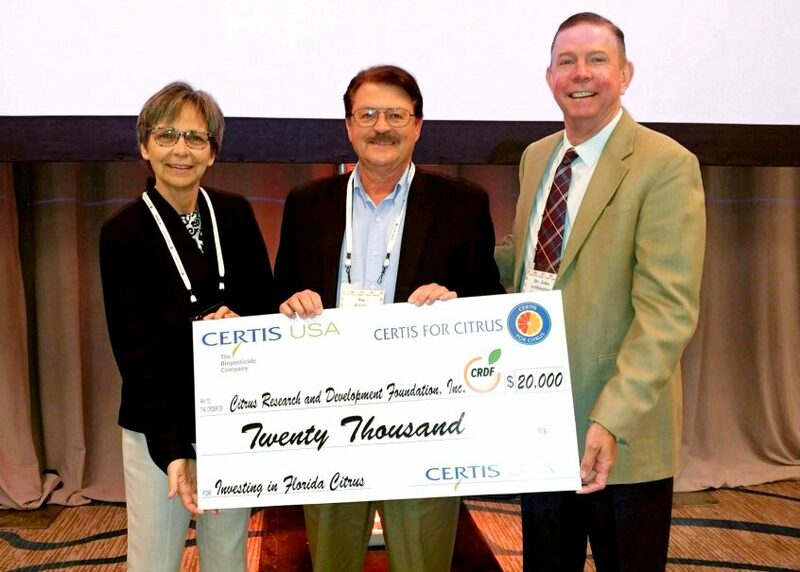 The biopesticide company, Certis USA, presented the non-profit Citrus Research and Development Foundation, Inc. (CRDF) with a check for $20,000 to help fund research projects in an effort to find a cure for huanglongbing (HLB; citrus greening). The presentation was made during the Florida Citrus Industry Annual Conference that took place at the Hyatt Regency Coconut Point Resort and Spa. Joe Craig (center) of Certis USA presents University of Florida’s Jackie Burns (left) and CRDF’s John Arthington (right) with a check for $20,000 on behalf of the Certis for Citrus program. The CRDF has oversight responsibility for HLB research and development efforts. HLB is one of the world’s most serious citrus diseases for which there is no current cure. Several states or portions of states, such as California, Florida, Georgia, Louisiana, Texas, South Carolina and the territories of Puerto Rico and the U.S. Virgin Islands have established both plant quarantines and Asian citrus psyllid restrictions to stop the spread of citrus greening. For more information about HLB, click here.